Street: The primary purpose of this social enterprise is to provide a venue where young people from the streets can gain skills needed for employment and living. 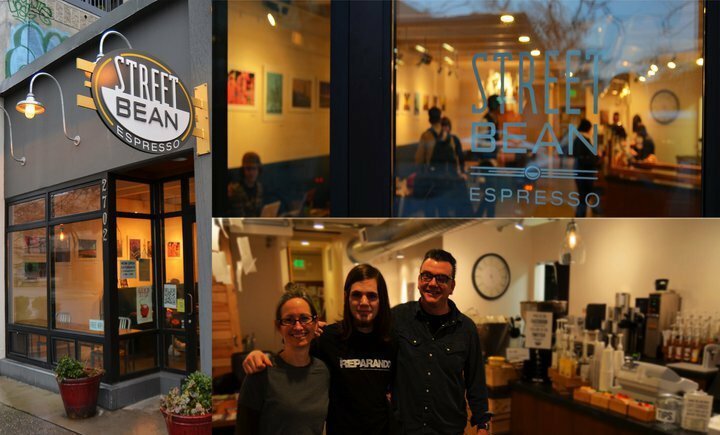 As more eloquently put on the website, they can “reclaim their lives away from (and yet in the midst of) the streets of Seattle.” Since it’s difficult to land that first job without employment history, an educational degree or diploma and sometimes even ID, the Street Bean enables youth to gain that work experience that’s essential for transitioning to any other company. Bean: Dedicated to providing sustainable products and services, the café serves coffee that is grown in Guatemala where they’ve formed direct relationships with the farmers. The café partners with Agros International to ensure these farmers gain the greatest profit, benefit and land ownership that will in turn help eliminate cycles of poverty. Espresso: Ultimately, Street Bean Espresso is a coffee shop dedicated to serving excellent coffee. While committed to doing good, they thrive on the fact that they are a competing business, a social enterprise, roasting coffee beans on the site for the highest quality product around. It’s refreshing to see a social enterprise like the Street Bean that bridging demographic divides, empowering youth, sourcing from sustainable farms and providing a well-made product that’s on par with their competitors. Now that’s quality in a cup! It seems counter-intuitive: scheduling time to play. How can that be productive? Yet in his book, The Now Habit, Neil Fiore argues that part of the solution to overcoming procrastination is the “unschedule”–that is, scheduling fun first then making the slots around that filled with high productivity. This is particularly important for entrepreneurs working on their own time, whether after hours from a scheduled job or full-time from an office, home or coffee shop. Rather than get our tasks done, it’s easy to procrastinate: check Facebook, send emails, water the plants, feed the dog, watch a TV show, sort the mail, talk on the phone and do everything except complete our task list, partly because we resent not having the time for recreation or socializing. I’ve been scheduling play for over a year now, and while there’s always room to improve, I’ve found life to be much richer since doing so. About once a week, I go through my Facebook invites, e-vites and other lingering invites and mark on my calendar the ones I’m remotely interested in attending. I try to make a definite reply as much as possible and found that I’ve attended more social events than I did before because my open-ended personality was so noncommittal, I would’ve let them pass before realizing I’d even been invited. This approach works especially well when combined with a bit of planning as described in Getting Things Done. In addition to invites from others, I have my own flexible fun lists to try to make happen by scheduling a few each season. This means that before heading out to an event or during my non-playtime scheduled slots, I can be super focused on what’s in front of me. Concerted efforts with 30 minutes of focus can produce a lot higher results than you might think! Even 8 minutes, as inspired by The 8 Minute Organizer, can knock out a kitchen cleanup or other task I’ve been procrastinating on. I find that if I spend just 8 minutes per day on personal email, I can prevent it from piling up and drowning me with unopened messages. All for tonight. It’s time to go schedule some fun! Last summer a good friend of mine did an internship at Tierra Nueva, a mini organic farm located nextdoor to Burlington, Washington. I got to visit her then and help harvest some of the produce in the fall both last year and this. What impresses me the most about this farm is their dedication to three main aspects of healing. 1. Heal the land. 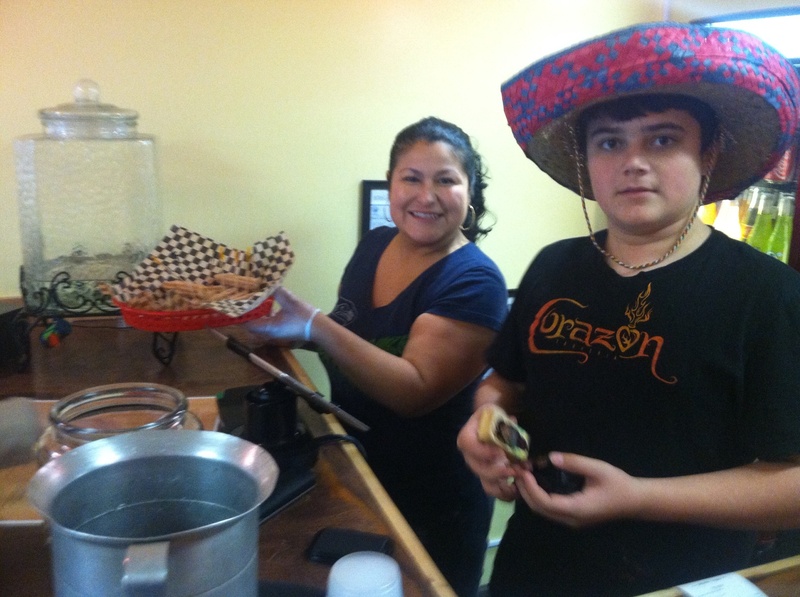 The staff at Tierra Nueva is dedicated to growing organic produce on healthy soil. One of their farmers told me a few weeks ago that they want to move away from using motorized methods when cultivating the land. Every season, they leave about half of their two acres to rest while carefully cultivating the other half. 2. Heal your body. They grow wholesome, healthy food that nourishes both the farm staff and those in Seattle or other nearby towns who purchase their produce boxes. Customers are invited to join in on the farming process by volunteering at a work party or harvesting U-Pick items. Plus, their website provides a delicious recipes list where you can search by produce type. I love that they partially fund their work through this social enterprise aspect. 3. Heal the community. The farm staff simultaneously works with both the local migrant community and people in recovering programs from the jail and juvenile detention. Two of the farm’s primary workers are a lovely couple–Salvio and Victoria–who speak Spanish fluently and were once migrant workers themselves. Another cool aspect is that women, men and youth in their recovering programs also participate in farm activities. For instance, one woman set up culinary classes in the barn where she taught group classes on how to cook with the fresh produce. Update: I drafted this post on Wednesday this past week. This morning I was talking to my friend who interned at Tierra Nueva and she told me that this lovely farm is closing because the produce sales were not covering expenses. I decided to publish this post anyway as a case study of an attempt well-made. Many social enterprises are difficult to sustain because they lack the organization, structure and strategy behind them (although even business start-ups often don’t take off until an entrepreneur’s third or fourth attempt). A short peruse of their website screamed for the need of a marketer and web designer. Transporting produce all the way to Seattle required a lot of time and fuel. Their new farmer (who will continue farming on another plot of land) said this land could have been better utilized. Yet in spite of its shortcomings, the farm met numerous needs during its time of operation and many of their practices and principles could be replicated in a myriad of other settings to bring about holistic healing for communities. 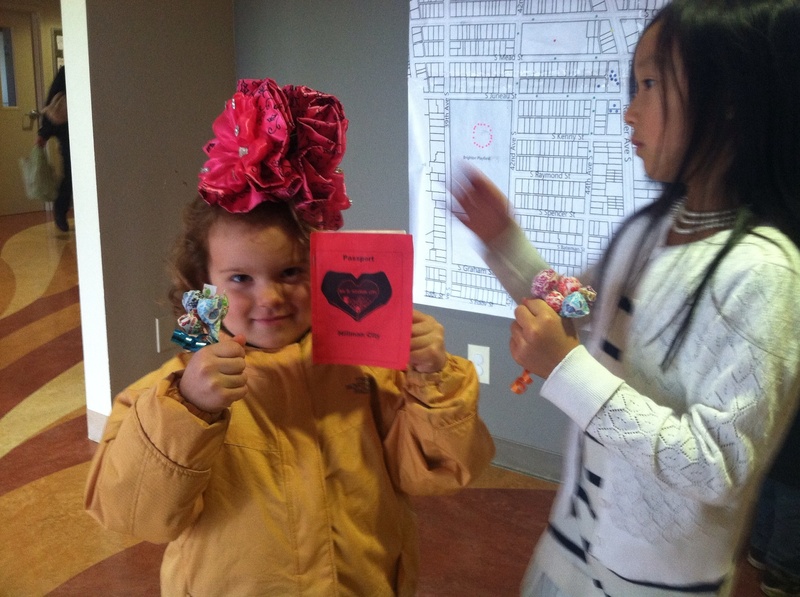 Participants holding lollipop bouquet prize and passport while sporting a unique find of the day: a giant hair bow. I posed the idea to my community development team and a few months later we launched our own version. 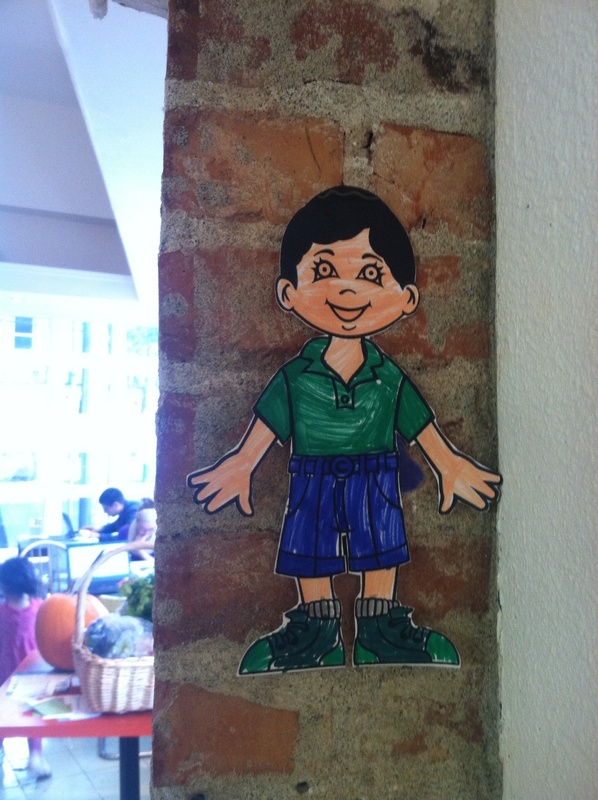 In place of Waldo, we had the youth from Rainier Avenue Church color children of the world cutouts. At first, we thought it may be difficult to convey to some shopkeepers who do not speak English as a first language the objective of this activity. In fact, the first shopkeeper I posed the idea to was hesitant. “I’ll have to check with the owner,” she told me. What is the most popular item in your store? What’s your favorite thing from this store? El Corazon workers serve us complimentary appetizers. His grin was telling. Yes!